**BLUETOOTH**, **ACCIDENT FREE CARFAX HISTORY**, **SERVICE RECORDS AVAILABLE**, **SIRIUS XM SATELLITE RADIO**, **REMOTE KEYLESS ENTRY**, **GUARANTEED FINANCING AVAILABLE**, **WARRANTY INCLUDED**, **A+ Better Business Bureau **. 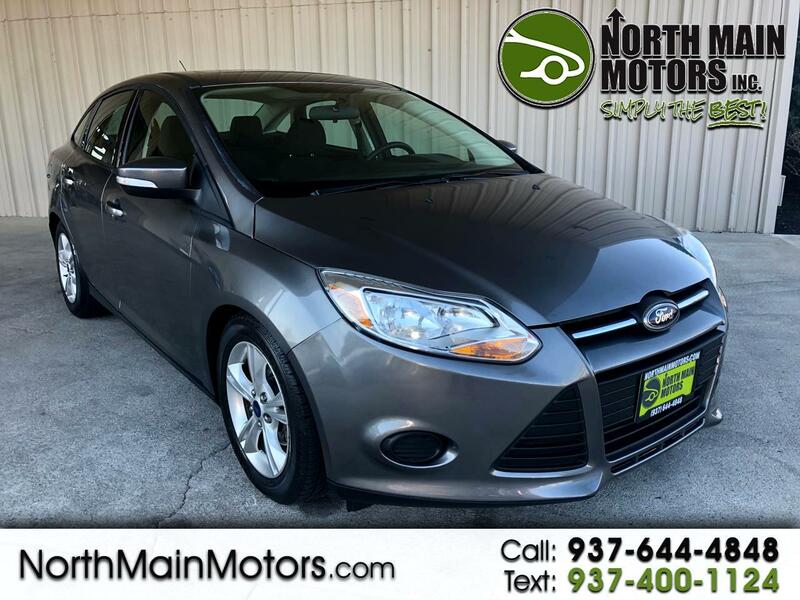 North Main Motors is pleased to offer this good-looking 2014 Ford Focus SE In Sterling Gray Metallic. This vehicle is beautifully equipped with 6 Speakers, ABS brakes, Air Conditioning, Alloy wheels, AM/FM radio, Brake assist, Bumpers: body-color, CD player, Cloth Front Bucket Seats, Compass, Delay-off headlights, Driver door bin, Driver vanity mirror, Dual front impact airbags, Dual front side impact airbags, Electronic Stability Control, Four wheel independent suspension, Front anti-roll bar, Front Bucket Seats, Front Center Armrest, Fully automatic headlights, Illuminated entry, Knee airbag, Low tire pressure warning, Occupant sensing airbag, Outside temperature display, Overhead airbag, Panic alarm, Passenger door bin, Passenger vanity mirror, Power door mirrors, Power steering, Power windows, Radio data system, Radio: AM/FM Single-CD/MP3-Capable, Rear anti-roll bar, Rear window defroster, Remote keyless entry, Speed control, Steering wheel mounted audio controls, SYNC Communications & Entertainment System, Tachometer, Telescoping steering wheel, Tilt steering wheel, Traction control, Trip computer, and Variably intermittent wipers! Reviews: * Want an efficient compact sedan with style, efficiency, technology and comfort that's still fun to drive? Give the 2014 Focus your close attention. Source: KBB.com * Nimble handling; refined and quiet ride; strong engine; stylish and well-made interior; abundant list of upscale and high-tech options. Source: Edmunds * Driving the 2014 Ford Focus is incredibly fun and enjoyable. It has a dynamic design, addictive driving experience, and an interior that immerses you into something that is definitely more than just a car. The Focus comes in 7 models to pick from: the Base S Sedan, SE Sedan, SE Hatch, Titanium Sedan, ST, Titanium Hatch, and Electric. New for 2014, there's a Sport Appearance Package for the SE, which has sport cloth seats, a leather-wrapped steering wheel and shift knob, and an available rear spoiler. Every drop of fuel is effectively used in the Focus with its 2.0L engine. Twin independent variable camshaft timing adds extra precision, contributing to fuel efficiency or power output. The electric power-assisted steering contributes to fuel efficiency as well. Plus, Active Grille Shutters help Focus make itself even more aerodynamic and fuel-efficient. This all helps Focus SE with the SFE Package achieve up to 40 MPG HWY, which equals less stops at the pump. For entertainment, there's SYNC with MyFord Touch, standard on Titanium and Electric trims, and optional on SE and ST. On select models, luxury comes in the form of leather-trimmed seats, dual-zone electronic automatic temperature control, ambient lighting, and 2 Interior Style Packages that feature two-tone leather-trimmed seats, matching door-trim inserts, coordinated steering wheel trim and more. The new Focus ST is geared to get you to your destination quickly. Mash the aluminum accelerator pedal and you'll be treated to the rollicking performance of its 252hp, 2.0L EcoBoost engine that's linked to a 6-speed manual transmission. An overboost feature can sustain increased torque (from 3000 to 4500 rpm) for 15 seconds at a time enhancing its performance feel. Source: The Manufacturer Summary From the moment you step on our lot until the time you drive away in your next car, your buying experience with North Main Motors is our number one priority. We encourage you to use the expertise and resources of our sales staff - they are here to help you find the right car at the right price. Call us today at 937-644-4848 to schedule your test drive!